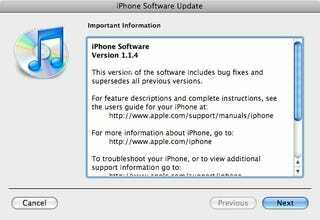 Click to viewiPhone 1.1.4 Update is Out. You can get it now from iTunes. Remember, if you have jailbreaked or unlocked your iPhone, don't install it. If your iPhone is clean, have fun. We will keep updating this space with our discoveries. Apparently, the 162.1MB update "fixes bugs and supersedes all previous versions." As Leander at Cult of Mac points out, do bug patches really take up 160MBs? SDK, here we come. iPhone 1.1.3 Jailbreak is Here!